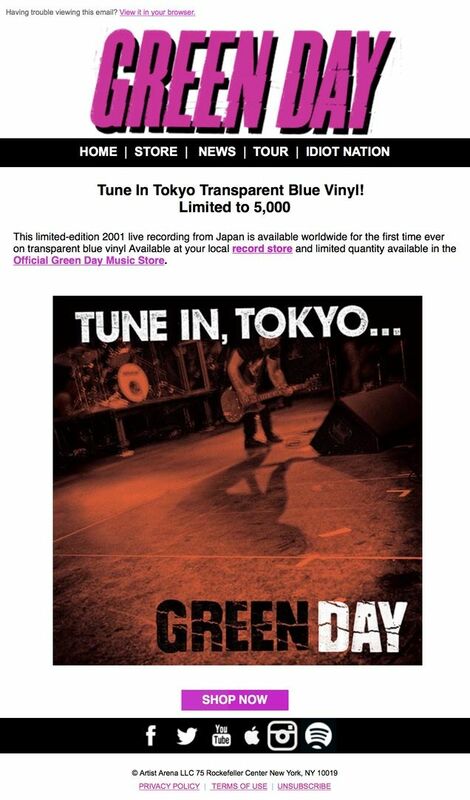 Green Day's Tune In, Tokyo... was released for the first time on vinyl today as part of Black Friday Record Store Day. The live EP from 2001 is currently available at record stores across the US and Canada today only. If you're not wanting to fight through the Black Friday shopping crowd or don't have a record store near you, you can now order the vinyl online via Green Day's online web store. The transparent blue vinyl is available for pre-order directly via Warner for $19.99. There are only 5,000 pressings available with most of them going directly to record stores. Warner states in their email to customers that there is a limited number available for online pre-order. There is currently no indication on when orders will ship or what the release date is. Tune In, Tokyo... is a live EP released exclusively in Japan in 2001 and contains six Warning tracks and one nimrod. track. The return of Green Day in 2015 - A hint from Billie Joe? 20 years ago tonight Green Day performed "Jaded In Chicago"
Billie Joe filming lead role in new movie "Geezer"